After the 29 July Mw 6.4 earthquake the August. 5 2018 Lombok earthquake struck Lombok, Indonesia with a Mw 6.9 (7.0 on Richter scale) shock, causing small tsunamis. 91 people were confirmed killed while more than 200 were confirmed injured. The distance between the epicenters of the 2 earthquakes was no more than 5 km. Astrogeographic position of the epicenter for morphogenetic field level 1 which defines the international, supraregional resonance and meaning of the event: the astrogeographical coordinates of the epicenter were 19°Libra currently under constant pressure from a long time square of Pluto at 19° Capricorn indicating consistent tectonic pressure which this time was effective from a southeastern direction. The 2nd coordinate of the epicenter was at 17°Sagittarius currently under long-time pressure from a square transit from Neptune at 16° Pisces indicating dissolution and instability of material effective from the east of the epicenter. With Pisces rising on the ascendant and with Neptune near the AC this time instability of tectonic material is to be considered as the main reason for the discharge of tectonic pressure through the earthquake. 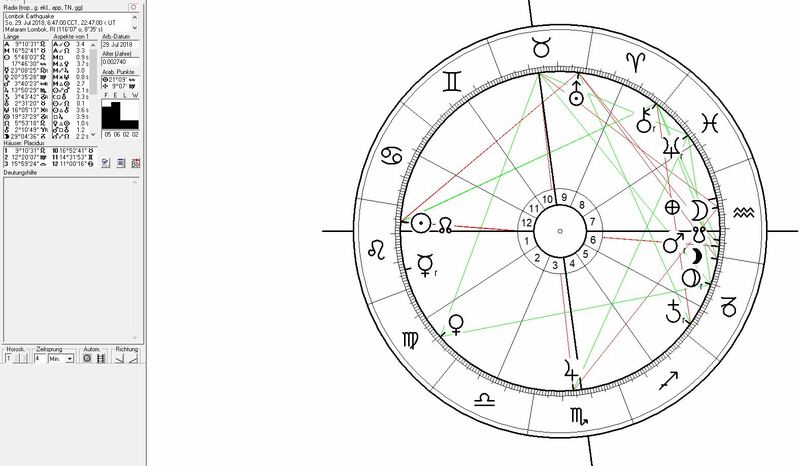 The formation of strongest pressure from Pluto and Saturn in Capricorn the sign of hardest material to the southeast of the epicenter may have caused pressure in the direction towards of the sun position in the north-east supported also by the sun`s gravitational forces. The transit of the Sun and Mercury in a trine to the astrogeographical position of the epicenter stands in support of the assumption of the effects of the gravitation of the sun as the triggering factor for the event. On July 29, 2018 at 06:47 AM (UTC) a magnitude 6.4 earthquake hit northern Lombok Island, killing 10 people and injuring at least 40 others, The earthquake was also widely felt in Baliand East Java. The earthquake had a depth of 7.5 km’s deep and was considered to be a shallow earthquake and amplified its affects. Astrogeographic position of the epicenter for morphogenetic field level 1 which defines the international, supraregional resonance and meaning of the event: the astrogeographical coordinates of the epicenter were 19°Libra exactly squared by Pluto from 19°Capricorn and 18°Sagittarius squared by Venus indicator of heavy pressure from particularly solid and large material from 20°Virgo from a southeastern direction and from Neptune indicator for instability at 16°Pisces (northwestern direction). The fact that the earthquake occurred not fully 24 hours after the full moon is a clear indication that the pressure release through the earthquake resulted from pressure exerted by the forces from the 2 major luminaries Sun and Moon. As can be seen Jupiter in Scorpio the sign of magma chambers near the IC and right below the epicenter stood for intense movements and pressure inside magma chambers as a triggering factor releasing long time pressure from Pluto`s square on the epicentrical area from a western direction. The distance of the 2 earthquake epicenters from Mt Rinjani the main Lombok volcano was onlo 13 and 17 km respectively. The danger of a new outbreak of at the Mt Ruinjani calderas is therefore to be analyzed. 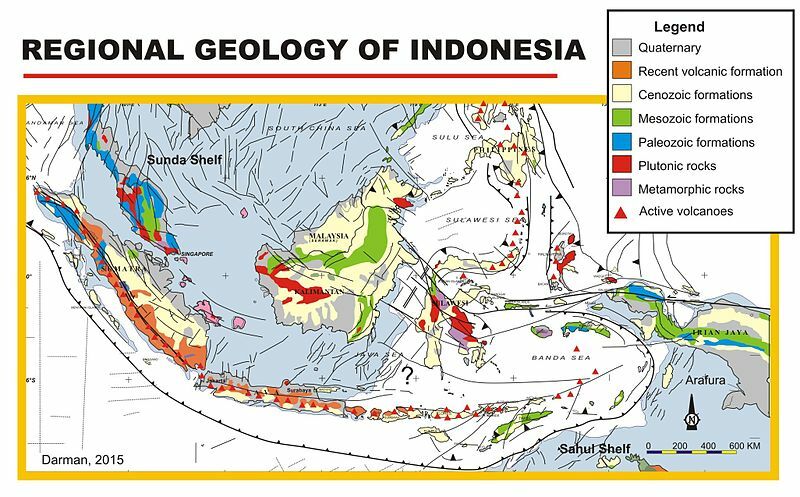 Astrogeographic position of Mt Rinjani caldera for morphogenetic field level 1 which defines the international, supraregional resonance and meaning of the event: the astrogeographical positions of Mt. Rinjani are 17°Sagittarius and 22°Libra. The strong resonance of the current transits of Neptune and Pluto during the two earthquakes could indicate that the current process of tectonic movements may lead to a new eruption at Rinjani volcano. The transit of Neptune square to the 17°Sagittarius position of Rinjani will be effective until March 2021. Plutos transit over the 22°Libra position of Mt Rinjani will have its climaxes in January and in November 2020 and will be effective until a final test of stability in October 2021. 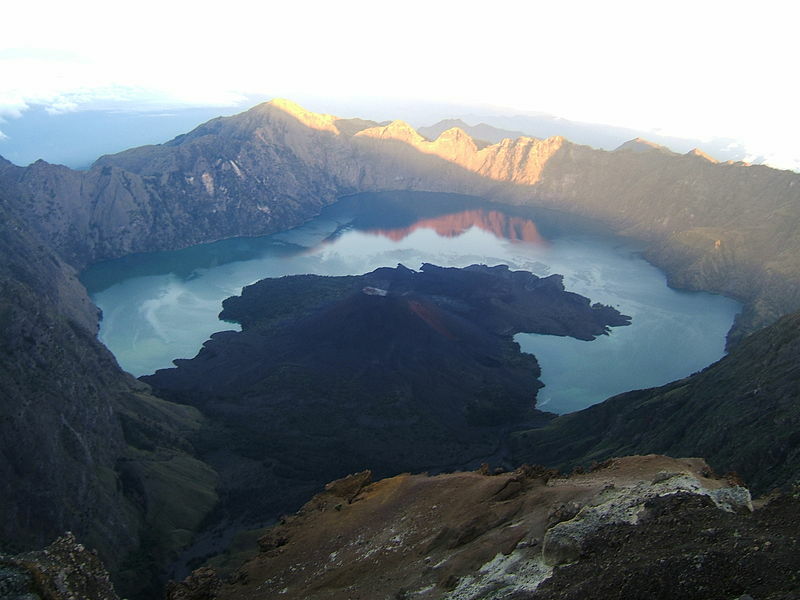 The caldera on the top of the volcano is 6-by-8.5-kilometres wide and filled partially by the crater lake known as Segara Anak due to the color of its water, as blue as the sea. This lake is approximately 2,000 metres above sea level and about 200 metres deep. The Sasak tribe and Hindu people assume the lake and the mount are sacred and some religious activities are occasionally done in the two areas. Astrogeographically the most important factor for the last eruption of Mt. Rinjani on 27 September 2016 seems to have beenthe opposition transit of Uranus over 23°Aries in nearly exact opposition to the 22°Libra astrogeographical position of Mt. Rinjani. This is confirmed also be the exact trine of the Moon at 22° in fire sign Leo a major astrological indicator for both magma and lava in relation to Uranus. I`m recommending that the coming Jupiter ingress in Sagittarius the sign of magma on 8 November 2018 should be observed as a triggering factor in relation to volcanic activity in the Mt Rinjani area. 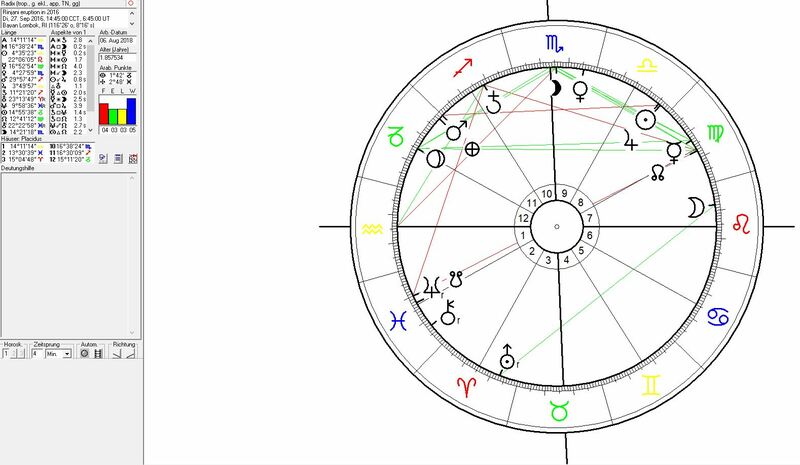 The climax of which will be Jupiter´s transit conjunct the volcanoe´s 17°Sagittarius position at the end of January and all throughout February 2019. Jupiter could stimulate movement of lava and discharge of tension. 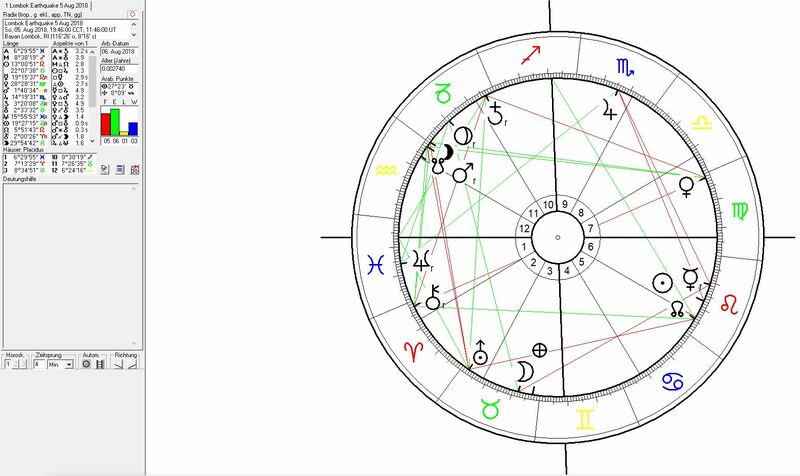 The real test for the accumulated stress and tension in the area might come during the Saturn-Pluto conjunction of 12 Jan 2020 at 21°56` Capricorn in exact square to the 22°Libra astrogeographical position of Mt. Rinjani. 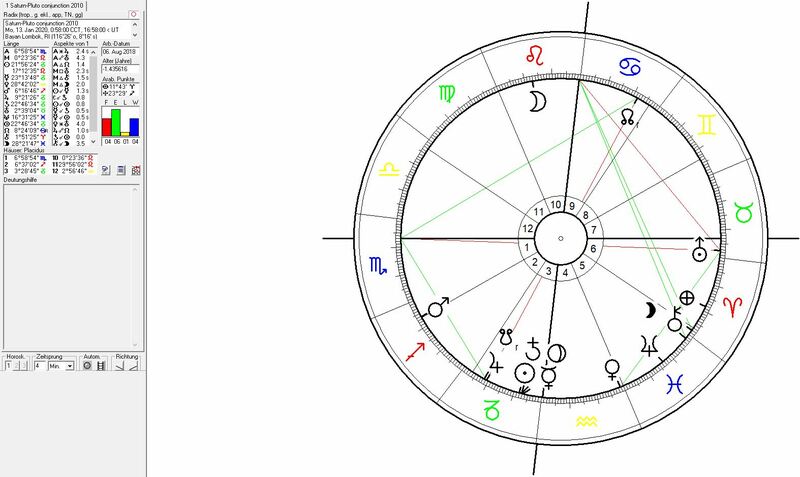 This is becasue the Sun as a gravitational heavyweight will join the Saturn-Pluto positions while the Moon will be in the sun`s own sign Leo (as major indicator sign of lava and magma) and in exact trine to the 17°Sagittarius astrogeographical pcoordinate of Mt Rinjani stimulating processes of discharge of accumulated tension.